English is an international language which is widely used in many countries around the world. It is very important for students to master English in all skills. The skills are Listening, Speaking, Reading, and Writing. Those skills are related to each other. In this case, the researcher is going to focus on writing skill. Writing is a language skill that is very important. The first significance of writing is that writing is the top level of a language. It is the last macro skill that has to be mastered by people who want to be able to communicate perfectly. The second significance is that writing is a productive skill. It involves producing language rather than receiving it. In writing, people will produce written language. The third significance of writing is that writing is the most complex macro skill in language mastery. In writing, people apply everything that they have got in the three stages before. The fourth or the last significance of writing is that writing is the stage of language mastery where people can generate ideas. In writing, people should construct the idea perfectly to make it so understandable that other people can catch the meaning or the purpose of the message (idea) in writing. Students in junior high school should be able to write or produce narrative text. It is not something attractive and fun for them to write narrative text although narrative text have purpose to entertain the reader. They know many stories related to narrative text but when they have to produce their own????????? 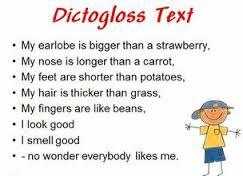 Belum ada tanggapan untuk "IMPROVING THE GRADE VIII STUDENTS’ WRITING SKILL OF NARRATIVE TEXT THROUGH DICTOGLOSS"